The first-ever Madden 17 Club Series Championship held over the weekend certainly lived up to the hype. Fans from around the country tuned in to watch as the eight winners from the Bills, Steelers, Jaguars, Vikings, Chiefs, 49ers, Patriots and Seahawks tournaments took the national stage for a chance to advance to the final round. David Katz “Bread” who represented the Bills in the match put on quite a performance against Pittsburgh’s “Misery” in the quarterfinals. Although he was not able to come away with the victory, Katz’s play earned him $2,500 and 175 series points. The winner of the championship, Seattle’s “Killer Mike” battled San Francisco’s “Monsta” in the exciting finale. With the win, “Killer Mike” took home $10,000, 350 series points and earned a place in the Madden 17 Championship that will take place later this month. 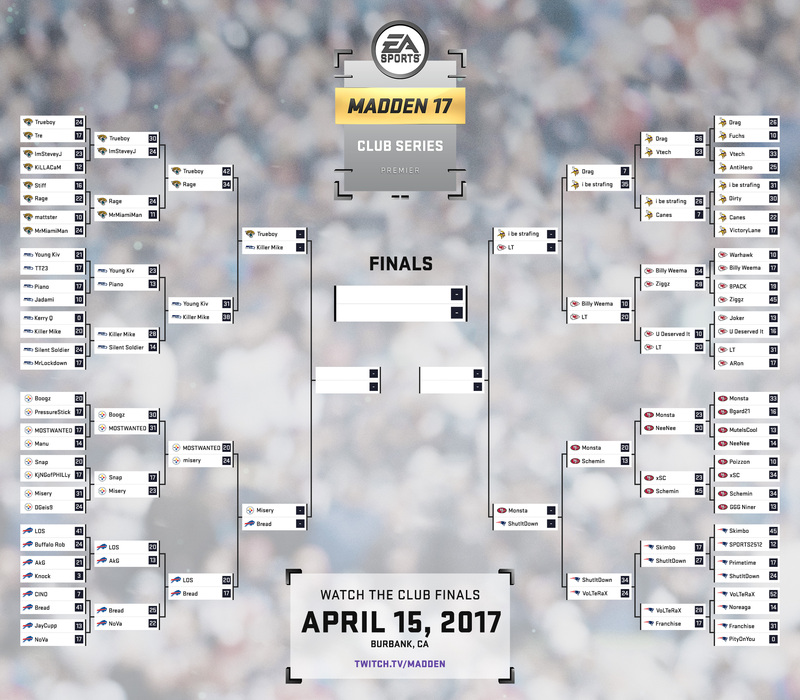 With the first annual Madden 17 Club Series Championship kicking off tomorrow, here’s a one-stop shop guide for everything you need to know. Similar to the NFL athletes who prepare tirelessly to compete on Sundays, these Madden experts are ready to put their skills to the ultimate test. These players aren’t just your average video game lovers. Their Madden 17 aficionados, who’ve logged some serious man hours and turned their passion into much more than a hobby. The winners from each game will advance to the semifinals and get one step closer to the highly coveted championship round. Representing their favorite teams on the big stage, the players are sure to pull out some unexpected trickery to get a leg up on the competition. Our very own ‘Bread’ is known to have a thing or two up his sleeve, so don’t be surprised if he’s got something in store. There’s nothing more exciting in the NFL than a game-changing play. The same is true in Madden 17. Whether you’re looking for crazy catches or momentum-swinging turnovers, this group of players will make it happen. For each of the tournament’s players, the stakes are high. Not only will the champion earn some serious bragging rights, they’ll take home $20,000 and 500 series points. However, the rest of the all-stars won’t be going home empty handed. Tune in on Saturday, April 15 at 2 p.m. PST to watch it all unfold. Bills fans, for the first time ever, the NFL will be crowning a Madden 17 champion! 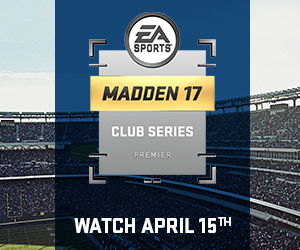 The Madden 17 Club Series Championship, held in Burbank, Calif. on April 15 at 2 p.m. – 7 p.m. PST, will feature some of the nation’s most talented gamers. The event will be broken down into three rounds and consist of the winners from each of the eight participating club tournaments. Representing the Bills in the Golden State is David Katz—also known as ‘Bread’—the winner of the Buffalo Bills Madden 17 Series Championship that took place in February at (716) Food and Sport. Throughout the day-long contest, Katz found himself up against some serious competitors. Playing for $10,000 in cash and prizes, and bragging rights of course, Katz defied the odds and pulled off a huge comeback win. With the victory, Katz has earned the chance to prove himself on the national stage. Wish him luck as he takes on ‘Misery’, the Pittsburgh Steelers victor, in the quarterfinals.